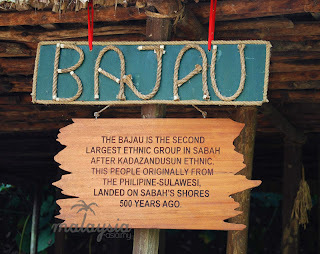 A popular excursion for tourists visiting Kota Kinabalu, is a visit to the Bajau water villages of Penimbawan and Mengkabong. The Bajau people are nomadic, seafarers who tend to live their entire lives at sea. The Bajau are not only resident in Malaysia but are also found in neighboring countries like Indonesia and the Philippines as their populations are generally concentrated within the waters of the Sulu sea. Commonly referred to as ‘sea gypsies’ or ‘sea nomads’, the Bajau people are fishermen who are renowned for their free-diving skills. The Bajau are known to dive to the depths of the ocean to hunt for fish and sea cucumbers, which they then offer for sale at local markets. It is said that the Bajau spend nearly five hours a day submerged in water. Many of them in fact, puncture their eardrums at an early age in order to develop this capability of spending long periods under water. The Bajau people of Sabah reside in water villages constructed on stilts in the midst of the ocean. On such idyllic Bajau water village is Kampung Penambawan, accessible via a short boat ride (aboard a traditional slim long boat) from Kampung Surusup near Tuaran. Kampung Surusup is located 5km north of the town of Tuaran, which itself is accessible via a 45 minute drive through verdant paddy fields from the city of Kota Kinabalu. Once you arrive at the Penambawan water village you are greeted by a truly charming sight, for in the midst of cerulean waters, within a picturesque cove, stands a quaint village composed of interconnected bamboo huts topped with roofs fashioned from Nipah palms. These huts stand on stilts built into the seabed and are connected by rickety wooden walkways. 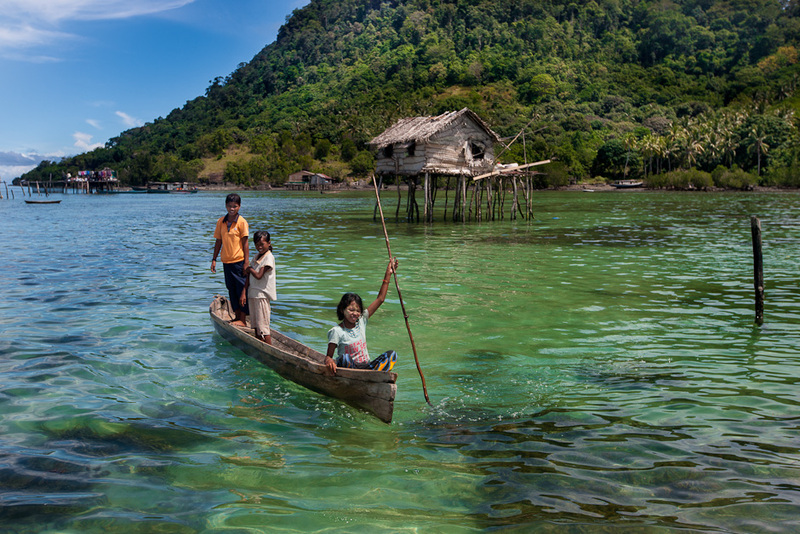 The Penambawan village doesn’t have running water or electricity, but it continues serve as the primary residence of the friendly Bajau, who seem to genuinely enjoy welcoming visitors and showing them around. Moreover, if there happens to be a celebration during your visit,you are immediately invited to join in the festivities. 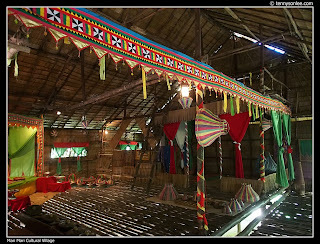 On your tour you will get to observe the Bajau as they go about their daily lives performing everyday chores like drying fish to be taken to the weekly market in Tuaran for sale, cooking meals, tending to children and more. Your visit to the Penambawan water village will perhaps take all of 45 minutes but the images and experiences that you will take back with you are sure to last a lifetime.